I was so excited when I found out that Milani was releasing new polishes for their High Speed line! I love these polishes! 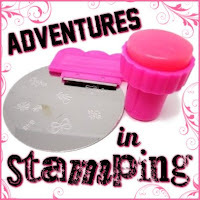 They typically have a great formula and are perfect for stamping! I had a very bad surprise when I went to use my first polish! So I was not able to swatch Flaming Race. Just look at that teal...gorgeous! And that orchid!! I really wanted to see how these polishes would stamp so I started with 2 coats of Instant Pearl, a beautiful white shimmer. I used the same polishes, except for my middle finger. I was able to stamp with Flaming Race. I am very satisfied with the new editions to the High Speed line! The formula is perfect and I can't wait to do some more stamping with them! Very pretty. What a shame about the one wonky brush. Oooh! Love the stamped mani!